Are you stuck in a nineties rut with your head-shot? Is the background color of your head-shot photo blue, khaki or white? If so then it’s time to modernize. Recently I took a look at the last round of head-shots I had done 6 years ago and realized that not only had styles changed but I had changed as well. My hair is a lighter shade, my face more mature and my attitude more confident. I wanted a new image of myself that reflected these changes. Taking another “portrait studio” head-shot didn’t feel like the best option to reflect my new attitude! 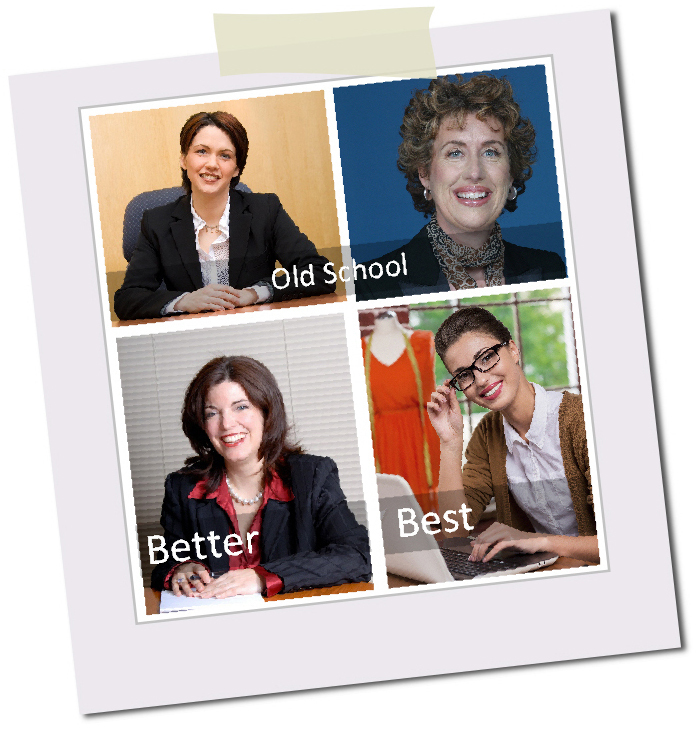 As image consultants it is our professional duty to present a successful and updated image but nothing says “outdated” like a headshot photo that looks last decade. Yes, I know, there is such a thing as a formal head-shot (basic black, blue or white background) and these are okay if you (or your client) need to appear “corporate”. Image, fashion or style consultants should look modern, in style and approachable to their clients, even corporate ones. Clients look to you to set the tone for the consult and if one of the first things they see is a boring, uncreative head-shot they can jump to the conclusion that that’s who you are. Remember, you only make a first impression once. Many of our clients are also looking for advice on how to take a profile photo to look fashionable, to attract others or to promote their personal brand. A good headshot can do all these things. So lead by example. And keep in mind that on social media people change their profile/ head-shot images monthly, weekly, or even daily, so sticking with the same image month in month out says you aren’t keeping up with the times. Look for and hire a good photographer using outdoor lighting, interesting props, and colorful interiors, not just solid color backdrops or green screens. Arrange for the photographer to shoot in environments that reflect personality (your consulting studio, a fashion showroom, or a boutique, for example). Visit Pinterest and key in “modern head-shots” – you will get lots of ideas and inspiration. Don’t rely on your iPhone or amateur photography when creating a head-shot. Don’t limit your creativity when composing the shot – have fun, be yourself but with the goal of creating a photo image that conveys a modern sense of style – you are, after all, an image consultant! Finally - don't be too wild with color, props or poses. Be authentically you and project your personality in your photo. Check out this site for ideas of successful head-shots taken outdoors with interesting backgrounds. Google “cool head-shot photos” to see how others are transforming the head-shot of old!